It is poopularly mainly in the punjab region of northern-India, and also notably in the regions of Gujrat. In Gujrat and Rajasthan areas, it is commonly cooked dry with tangy spices. In India, it is often eaten with a type of fried bread and is known as chole bhature. 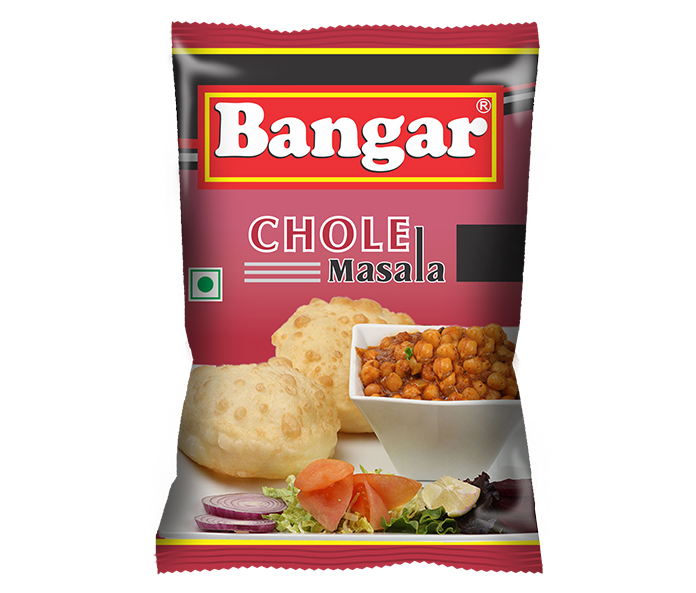 Bangar Chole Masala is a blend of pure spices evenly balanced for taste and flavour of chole made from chickpeas. Used in mostly variety preparations involving chickpeas. Served hot with rotis or fluffy bhaturas. Black pepper, Black salt, Cassia, Cardamom, Cassia Leaf, Chilli, Asafoetida, Bishops weed, Black Cardamom, Clove, Coriander, Cardamom seeds, Cumin, Dry Mango, Dry Ginger, Kachri, Mace, Mint Leaf, Fennel, Mustard, Pomgranate Seeds, Nutmeg, Tamarind, Turmeric & Common Salt. Wash and soak 150 gms chickpeas(Kabuli chana) in enough water overnight. Add enough amount of water as the chickpeas increase in size after soaking it. In a pressure cooker add the chickpeas, enough water, salt and pressure cook for 5-6 whistles. The chickpeas should be soft when you mash it with a spoon. In a pan, add 1tbsp oil. Once the oil becomes hot, add 2 chopped onions. Fry till they become transparent. Now add 1 tsp ginger paste. Once the raw smell of the ginger disappears, then add 3 chopped tomatoes. Add a little salt so that the tomatoes gets cooked fast. Add Bangar Chole Masala to the onion-ginger-tomato mixture. Now add the boiled chickpeas with a little quantity of its broth. You can add more broth if you want more gravy. Check the salt first as the while boiling the chickpeas we added salt and we are using the same broth. Simmer for 5-7 minutes. Garnish with chopped onions and Coriander leaves.